Looking for the perfect gift this holiday season? Look no further than an Ambre Blends Gift Set! We have so many options for you to choose from, there’s something for everyone. 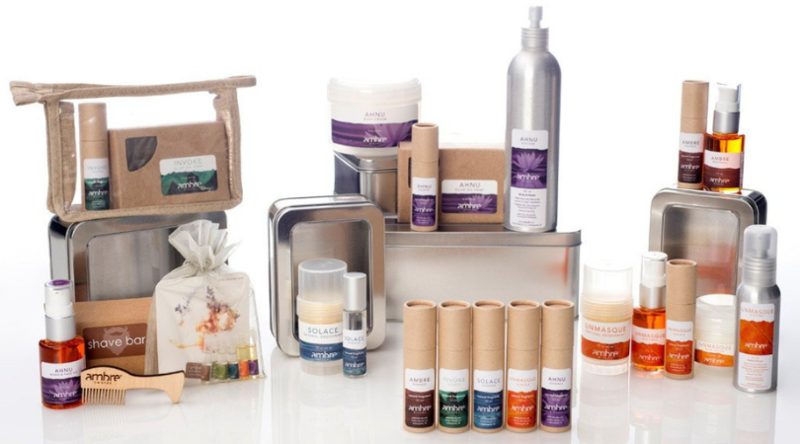 Why buy an Ambre Blends Gift Set? One of the best benefits is that you save money! Each gift set that we have available is cheaper than if you would buy the products separately. And not only do you save money, but they all come housed in reusable containers that stay true to our commitment to being a green company. Four 10ml Roll-On Tin Set: A $184 value, you can get a tin with all four essences for $159. This is the perfect set for someone who wants to mix and match all four essences to create a unique scent that’s all your own. If you don’t want to keep the Roll-Ons in the silver tin, it’s recyclable! Ambre Blends Travel Bag: If you’re always on-the-go or a jet-setter, you need an Ambre Blends Travel Bag. Valued at $155, the Travel Bag is available in all four essences for $136. This includes a 10ml Roll-On essence, 2oz Body Cream, .85oz Skin Tonic, 2oz Spritzer and .75oz Natural Deodorant, all approved for air travel. This comes packaged in a reusable eco-friendly PEVA (recycled phthalate-free) vinyl bag with hemp sides and trim. Ambre Beards Kit: All of our products are unisex, and now we have our first ever product set designed specifically for men. Utilizing our signature Ambre Blends scents, we have designed these products to meet the grooming needs of the modern man. Available in all four essences, our Ambre Beards Kits ($70) includes a Face & Beard Tonic, shave bar, mustache/beard comb and a sample pack of our oil essences to make you smell as good as you look. 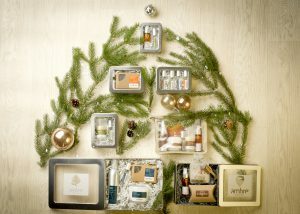 Large Gift Sets: If you love the entire product line, purchase a large gift set (valued at $186). For $175, you can use not only the 10ml Roll-On in the essence of your choice but also an 8.5oz Body Cream, 8.5oz Spritzer and Pure Olive Oil Soap. Combine all of these products for a luxurious skincare routine. You’ll smell as good as your skin feels! 10ml Roll-On + Natural Deodorant: Have you been searching for a natural deodorant that actually works? Ambre Blends Natural Deodorant has been featured in the Huffington Post and Organic Spa Magazine among other publications as being a top pick! This gift set is your chance to try it out, containing a .75oz Natural Deodorant and 10ml Roll-On in the essence of your choice. Skin Tonic Gift Set: The recipient of this gift will be singing your praises during the wintertime. This set includes a .85oz Skin Tonic and 10ml Roll-On in the essence of your choice. Ambre Blends Skin Tonic is a lifesaver in the harsh winter months keeping your skin moisturized and hydrated, providing a healthy glow to your face and body. Your skin will be vibrant while also radiating your favorite Ambre Blends scent! Soap and 10ml Set: Have you tried our Pure Olive Oil Soap yet? Great for your body and face, and even for shaving, this soap is high in antioxidants to feed and nourish your skin leaving it silky and hydrated. Use the Pure Olive Oil Soap in the essence of your choice, and then apply your Roll-On Essence after you get out of the shower and you’ll be radiating your favorite scent all day long! With so many options, you can’t go wrong this holiday season with the gift of Ambre Blends. Not sure what you should get? We also have gift certificates available!